Setting objectives is a fundamental element of any successful business. A good tool to see at a glance if you’ve reached your goal is the gauge widget. Depending on the metric displayed, the order of colours can be inverted. 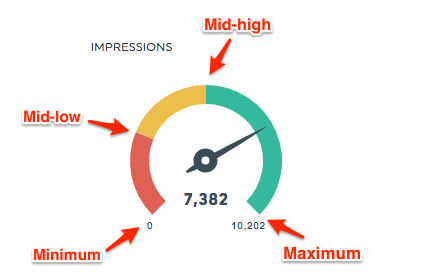 For some metrics, such as Impressions, the higher the result the better. For these metrics, the order is red, orange, and green. However, for other metrics, the goal is to have the smallest number possible, the cost for example. For those metrics, the order of colours is green, orange, and red. When you create the widget, default thresholds are shown in it. In order to set the thresholds, the system calculates the average of the last 12 completes periods that appear in the historic of your dashboard. The average is set as the mid-high threshold. The minimum is set to 0. 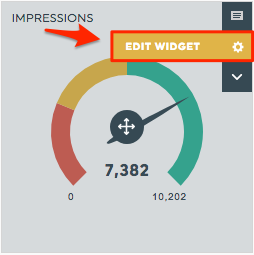 In this example, the average number of Impressions in the last 12 completed periods is 5 101 (automatically calculated by DashThis). The mid-high is then 5 101. The maximum is 10 202 (5 101 x 2). The mid-low is 2 550,2 (5 101 / 2). You would like to change the thresholds and set new goals? No problem, you’re just 3 clicks away from a personalized gauge widget! In order to set your own thresholds in the gauge widget, hover over it, and click Edit widget. The Edit widget panel will appear on the right side of the screen. Choose the section Visual display and change the thresholds to suit your needs. 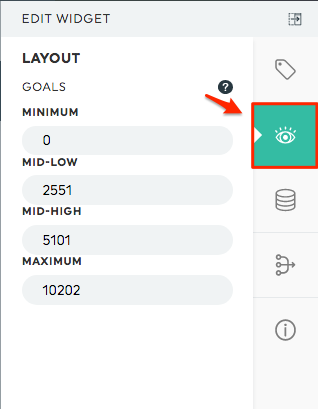 Please note that when you modify the goals, the changes apply to the default period (last completed period) as well as to the current period only.